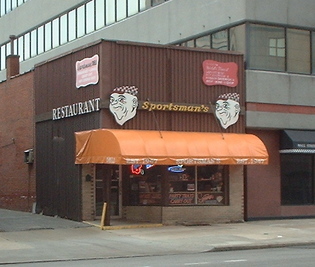 The Sportsman's Restaurant at 101 Saint Clair Ave is right across the street from the Cleveland Marriott Downtown at Key Center and near one of the bus stops I sometimes use. I'd often wondered what their Corned Beef was like and made sure that it was on my list to try some day. At first glance, it didn't seem too impressive. The small, narrow restaurant was darkly paneled (or was that the effect of the poor lighting?) and on the surface, seemed unlikely to produce much excitement. It's important though, to not judge a book by its cover! Or a restaurant by its lighting. One of my work colleagues says this is the place to go before, during and after Browns games! On to the food: The sandwich was excellent and the service was sufficient. No doubt, had we been regulars, the service would have been stellar. 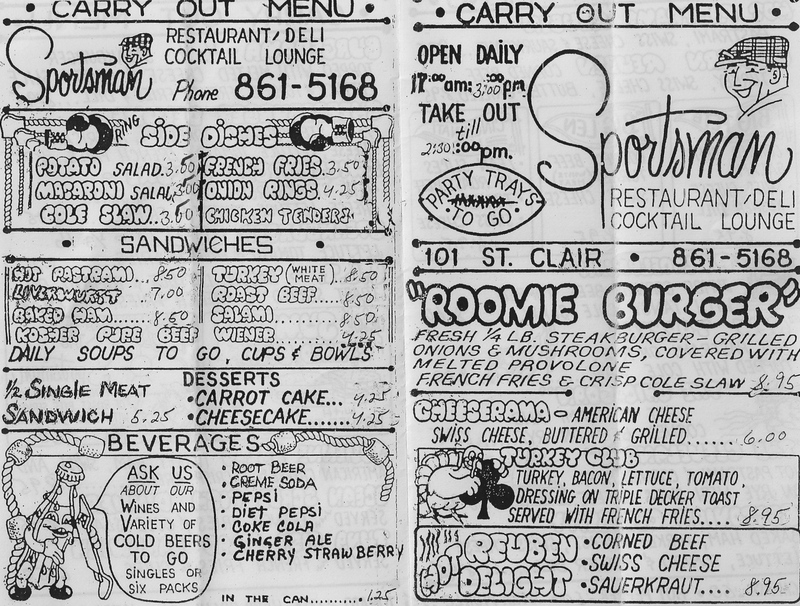 I'll be looking for some history of The Sportsman's Restaurant in the coming months. It certainly has some character. I think the men's room may have some original plumbing in it still! Overall, it's a Corned Beef venue that I'd visit again and we'll add it to the map that we're using to track our progress. 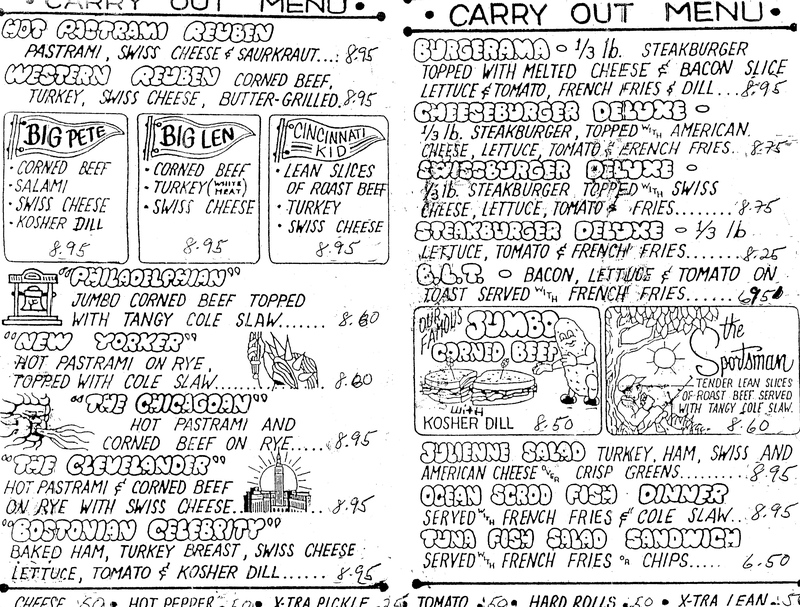 Their take-out menu was very impressive (page one and page two) with a wide assortment of meals, sandwiches, drinks and desserts. One of my colleagues ordered and very much enjoyed a Pastrami and Corned Beef ("The Clevelander") while I stayed with the Corned Beef. Try them out! 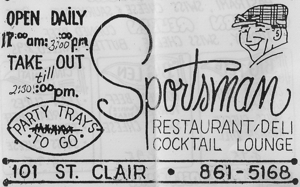 You can find The Sportsman's Restaurant at 101 East St. Clair in downtown Cleveland. If I had known the passions that Corned Beef raises in this town, I might not have started. Today, for example, I asked a few coworkers for suggestions on where I might find a good Corned Beef Sandwich. I needn't have asked—"Slyman's", they all replied. "But what about around here?" (Public Square), I asked. And so ensued a lively debate. A few weeks back I was taking pictures of the Sportsman's Restaurant (Established 1947) on St. Clair. A woman accosted me and asked me what I was doing. I explained my strange hobby and she turned ferocious: "The really do serve the Best Corned Beef in Cleveland there!" Well, I would try them and see how they rated, I replied. "No, you don't understand, they really do serve the best!" she reiterated. There are so many places that claim to serve the best! 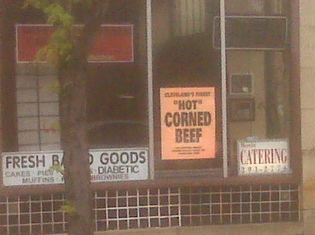 Yesterday evening in Cleveland Heights, I found a small restaurant on Noble Road that claims to serve "Cleveland's Finest 'Hot' Corned Beef". I imagine there's a company out there churning out these signs since they seem fairly common. Perhaps I'll get a closeup of one and we can figure out where they're coming from. Maybe I'll even figure out how to obtain one of my own. 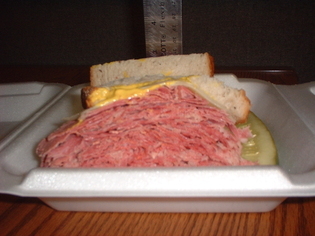 Maybe we'll find a giant conglomerate with a near monopoly on the regional Corned Beef distribution. Maybe I'll just gain a pound or two in the process. Later this afternoon in the office I was asked what I liked about Corned Beef. I explained a bit of what I was looking for. And, in exchange, was treated to this individual's passion for the subject. He likes it crumbly. No fat to keep it all together. Definitely crumbly. I have since asked him to be a guest writer on this site. Of course, his passion will be different than mine. But he displayed a passion for Corned Beef, nonetheless. Me: Do you do take-out? Me: Do you have corned beef sandwiches? Me: Can I get a corned beef sandwich to go? Them: Sure, whaddaya want on it? Me: Make it the way you like it best. With a coke. Them: <pause>Whatever. It'll be a couple minutes. Or something like that. On my way over I tried to convince myself that they weren't being rude, just curt. Or efficient, yeah, that's what it was. The were just being efficient. Didn't have time for silly questions. It was ready by the time I got there. On the counter, even. I grabbed a root beer from the case behind me, slapped down $10.95 for both items and palmed a business card from the counter in front. The price seemed a bit steep but I was willing to wait to pass judgment until I was back at my desk. 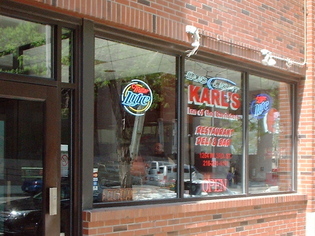 Karl looks just like his picture/drawing (below) and his son (I think I heard him call Karl "Dad") can be seen below and to the right of the Miller Light sign (right). Both were extremely polite, pleasant and exhibited great customer service. I won't be so timid next time! Superfluous apostrophes bother me (and this guy, too), so I wondered about their sign on the way back. 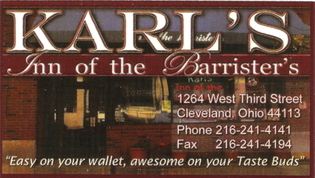 Should it be "Inn of the Barristers" or "Inn of the Barrister's"? They don't seem to discriminate, so I won't either. If they can make a great-tasting sandwich, who cares, I suppose. Back at the desk, the ruler showed that this was by far the tallest sandwich so far, right at 3" thick. And I'm fairly certain it was also the heaviest. 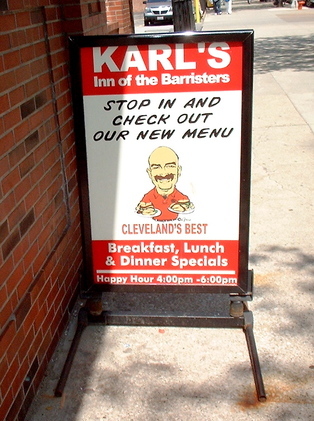 Karl certainly makes a good sandwich, too. Pressed between to slices of rye, with a little yellow mustard and some mild white cheese (swiss?) it was a delight to eat. It was a good sandwich, the biggest I've had yet. 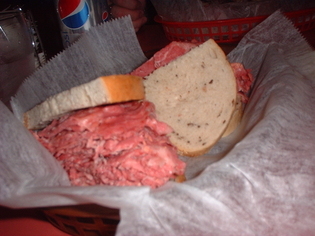 Is it the Best Corned Beef in Cleveland? With over twenty on the still-expanding list of known remaining candidates, I suppose it's still too early to tell.